California Republicans Effectively Constrained a Trump-like Candidate in 2014, Why Couldn’t the RNC? Parties have preferences, the recent DNC email leak showed that much. My year in the field with the California Republican Party (CRP) revealed further that the preferences of party leadership can make a great difference in the nomination process. Though this presidential primary season illustrated well the limitations of party power when it stands at odds with the active base, i.e. the 9% of the public that voted in the primaries. When a party’s base votes counter to the formal party leadership’s preference (e.g. first Jeb, then anybody but Trump) it then becomes increasingly difficult for the leadership to both covertly and overtly work toward that preference. Parties have formal leadership positions to exercise some control over their messaging, candidates, and ultimately, electoral and policy outcomes. Inherent to control is the ability to steer change. Still, when leadership desires reform it can be restrained by the base and the brand that helped build it. The GOP’s use of nativist and anti-immigrant sentiments has complicated both their ability to exert control, and their ability to reform. It is here that recent California history informs greatly on the dynamics we see playing out nationally. In 2014 the CRP was able to exert control to ultimately nominate a reform Republican candidate, Neel Kashkari, even while a significant and vocal portion of its base favored Tim Donnelly, an ex-Minuteman member of the State Assembly whose overt anti-immigrant rhetoric stoked the fear and nativism of a primarily white base. Taking cues and funding from the RNC and its post-2012 election outreach attempts – The Growth and Opportunity Project – the CRP sought reform and rebranding. If the CRP nominated a candidate like Tim Donnelly it would be detrimental to the party’s image in a now majority-minority state. In Donnelly, California witnessed firsthand the “Trump phenomenon” a year before the rest of the nation. The similarities between the candidates’ campaigns are striking. Donnelly called for isolationist policy, cutting off of resources to California’s undocumented population, and made claims almost identical to Trump’s now infamous incendiary remarks about Mexicans: “Of that 20%, how many are rapists? How many are murderers? How many are child molesters? And how many are terrorists? We don’t know.” Donnelly was also the conservative base favorite, consistently leading Kashkari in the polls by 10%, much to the dismay of the party organization on the state and national level. The GOP’s preference for keeping Donnelly away from the nomination was not only known but also used as campaign strategy, with Donelly using an “anti-establishment” and outsider image, also not unlike Donald Trump. 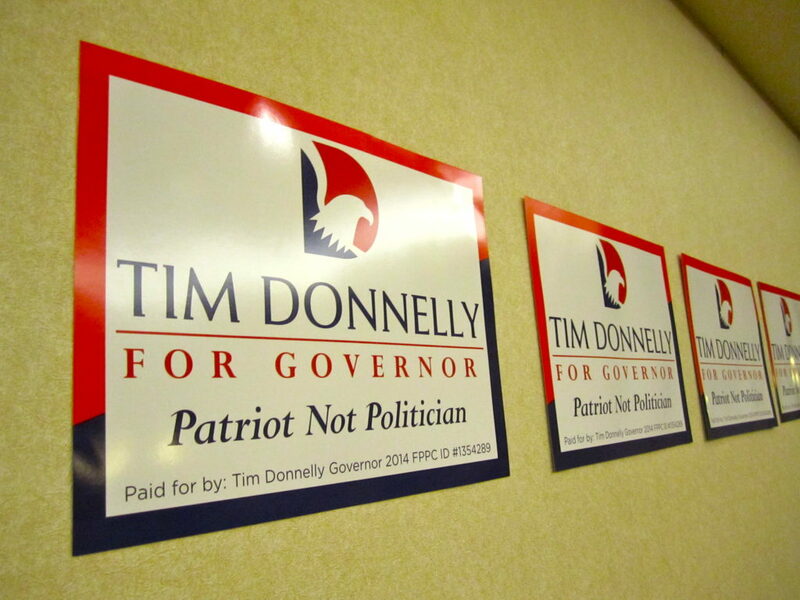 (The phrase “Patriot not Politician” was Donnelly’s slogan of choice). While the CRP had embraced similarly anti-immigrant policy and rhetoric in the nineties, particularly under Gov. Pete Wilson, the new CRP held goals of making gains with minority voters in California, as did the RNC in future presidential contests. If Tim Donnelly was not able to get the Republican nomination in California because of the formal leadership’s goals of reform and outreach, why has Donald Trump been successful in clinching the nomination? Put another way, why was the national party organization unable to exert enough control to nominate a reform presidential candidate, or at least a less brand-damaging candidate? It is a matter of scale restraining party leadership, and brand inflexibility. Early in the presidential race it was clear Trump was, to say the least, not a favorite with Republican leaders both in the national party organization, and its affiliates in Congress, but with 50 largely independent primaries and caucuses the party was limited in exercising the same degree of preference control seen within the CRP. The CRP could, and did, utilize institutions both in and out of the convention setting to ensure a leg-up to the candidate they preferred. Further, the GOP has built a brand on coded racial language, and has used anti-immigrant sentiments to mobilize white voters. Now when confronted with Trump’s unrestrained nativism, more overt anti-immigration sentiments, and not-so-coded appeals to race and white identity, prominent Republicans face the dilemma of sticking to reform of racialized strategies, and straying too far from brand and alienating their base. Recognizing this dilemma, and faced without a competitive alternative, Republican leaders once vocal against Trump have moved to endorse, seemingly ditching the reform efforts this go-around and doubling down on the white identity strategy, a strategy largely cited as destroying the CRP in the 1990s. Nicholas Boushee is an assistant professor in the History and Political Science Department at San Diego City College. How can this strong racist rhetoric and non-party affiliation influence millennials that what to become political figures within the Republican party.